Back on the agenda this morning, the Old Quitman Road Bridge replacement over the CSX RR has been discussed since at least 2011 when it was on the T-SPLOST list, and in September 2016 it came up for discussion again, and the Commission approved surveying and engineering. Last month they discussed the plans, drawings, etc., and approved those. 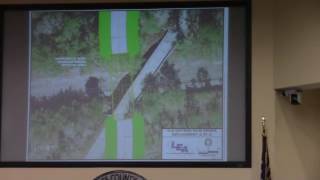 See this playlist of LAKE videos of this item in previous meetings. This morning’s item for voting tomorrow evening is a right of entry agreement with CSX, which the agenda sheet says is to allow Lowndes County Engineering “and their professional service consultants Lovell Engineering and TTL to enter the railroad right of way to conduct field investigations, complete a topographic survey, and conduct soil borings for the bridge foundation investigation”. Also on the agenda is Crossing Closure Agreement between CSX Transportation, Inc. and Lowndes County, which the agenda sheet says is about the “Dasher Johnson Road highway-rail at-grade crossing”, which you wouldn’t know from the listing in the agenda. Sheriff Ashley Paulk wants the county to buy a dozen pursuit vehicles which according to the agenda sheet will cost either $387,340 from Cass Burch for 2017 Dodge Chargers or $309,636 from Langdale Ford for 2017 Fold Police Interceptors. I bet they’ll pick the latter. I seem to recall the Sheriff said in the recent retreat that he had money for 10 our of 12 vehicles and he got a package deal. No County Commission meeting is complete without drugs and alcohol. WORK SESSION, MONDAY, February 27, 2017, 8:30 a.m. REGULAR SESSION, TUESDAY, February 28, 2017, 5:30 p.m. This entry was posted in Alcohol, Government, Law, Lowndes County Commission, Safety, Transparency, Transportation and tagged 2017, Alcohol, Ashley Paulk, bridge, CSX, February 27, Georgia, Government, Gretchen Quarterman, LAKE, Law, LCC, Lowndes Area Knowledge Exchange, Lowndes County, Lowndes County Commission, Old Quitman Road, Safety, Sheriff, Transparency, Transportation, Valdosta, Work Session on February 27, 2017 by John S. Quarterman.